2017 was our 4th full harvest and picking went about as usual compared to the past few seasons. We were lucky to have our dad and co-founder of the farm Ken Bice, here on harvest weekend. Cristi’s mom, Gloria was also here from the beautiful Garden Isle, Kauai, Hawaii. I could not pass up the opportunity to capture images of three generations of the Bice family working together on the farm! October was warmer than normal here in Sonoma County, which made the olive fruit change to purple earlier than previous years. We actually harvested twice, with the main harvest at the end of October being the earliest we have had since the grove began producing over 5 years ago. We finished picking again just after Thanksgiving, and the harvest was completed. 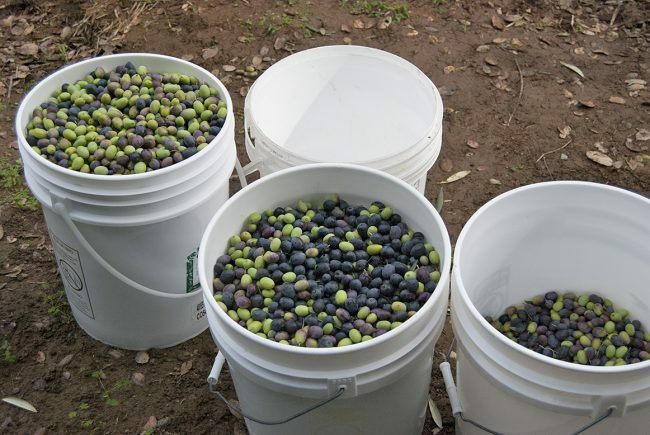 The second harvest consisted mainly of our Frantaio variety olives as they do traditionally ripen a bit later than the other Tuscan varieties we grow for our Capracopia Tuscan Varietal Oil. This year we used our “olive catching hammock” for the first time, which Scott said helped in our hand picking system. 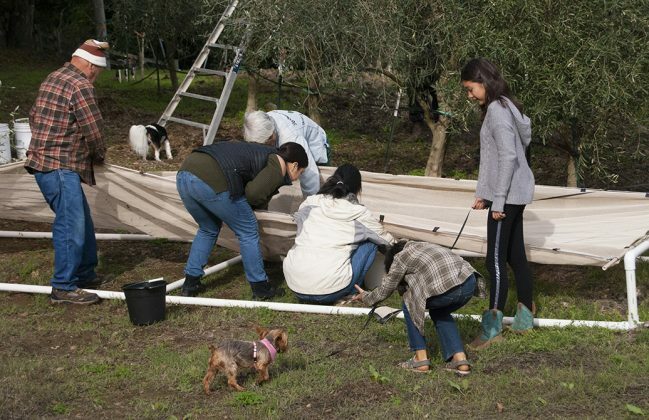 We began by raking the olives off the tree with our hands and letting them fall onto the canvas of the hammock. Next, at certain points we pulled up the small velcro cover in the center to let the olives fall into the bucket—simple and efficient. We could not have asked for a more gorgeous late fall day for the second harvest, the sun warming our fingers as we worked together picking and sorting over the new hammock and filling bucket after bucket. 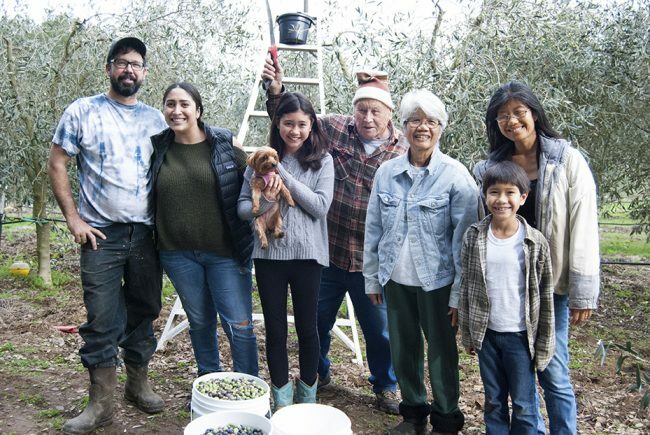 After delivering the harvest to local Sebastopol olive press, Olive Leaf Hills, we were returned seven gallons of olive oil from the first picking and two additional gallons from the second. Overall this yield was down slightly compared to 2016, but we know that with farming, no two years are ever the same. It was nice having the early harvest for the Olio-Nuovo it produced, and available just in time for our final farm tours of the season! The fresh olive oil was green, with grassy, pungent notes resulting in a special Extra Virgin oil high in polyphenols. We’ve found the Olio Nuovo excellent as a dipping oil paired with rustic, artisan breads as well as splashed liberally on fresh greens and finished with balsamic vinegar. 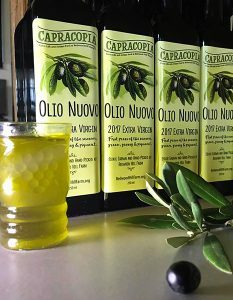 You can purchase Capracopia Olive Oil on the farm during our upcoming tour season, click here for the more information and this seasons tour dates. We also have a limited amount of oil from the harvest to ship. If you would like a bottle or two for your pantry or a friend’s, simply send us an email and we will contact you with details and shipping arrangements. Thanks to all of you who came to say hello and spend time with us in 2017. The Redwood Hill Farm harvest is complete and with the colder, shorter days of fall and winter, we look forward to more time in front of the hearth as we browse seed catalogs, plan the spring garden as well as the goat shows we’ll be traveling to next season. With that planning will be the dates for our spring farm tours and workshops, so please stay tuned! Check back at our website tour page or join our Farm Community Newsletter and you’ll be the first to have our spring schedule for tours and all the events planned for spring. It’s going to be a special year for us as we’ll be celebrating Redwood Hill Farm’s 50th Anniversary—plan to celebrate with us! Direct from our Sonoma County farm: artisan olive oil, orchard blossom honey and creamy, nourishing goat milk soap are now available for gift-giving (or just for you)! 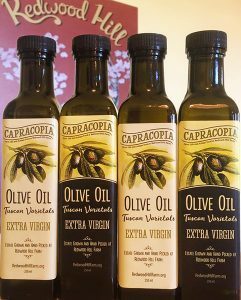 TO ORDER: Send us an email at capracopia1@gmail.com with the items you’d like and the shipping address, including zip code. Please include your phone number as well in case we have questions about your order. We will reply to you and confirm the shipping cost and date your gift pack will ship. Enjoy the fruits of our labor in this fragrant extra virgin olive oil. Our olives are hand-picked by family and friends, insuring that the carefully selected fruit is of optimum quality when it arrives at the mill. Rich and complex, with complementary fruity and peppery notes, it is delicious. In central Italy, Olio Nuovo is highly prized and ends up on restaurant tables to accompany almost every imaginable dish! This special oil was our first press of the 2017 season and is green with a grassy and piquant taste. High in antioxidant polyphenols. Enjoy in the traditional method on crusty, toasted artisan bread. Also excellent for dressing greens or drizzling on warm steamed vegetables with a squeeze of lemon. We have a few jars left from our summer honey collecting. This honey has the unique characteristics of our abundant fields: lavender, rose, wildflowers, and fruit tree blossoms. 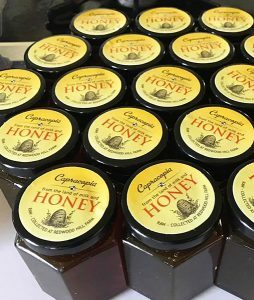 Our honey was a very popular item with farm tour visitors this year. 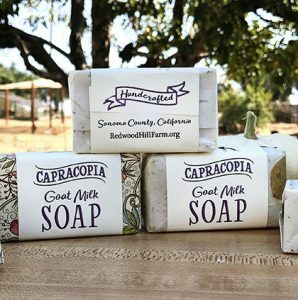 Hand crafted by a local Sebastopol soap maker, Capracopia Goat Milk Soap is creamy and nourishing to the skin. It is made with Redwood Hill Farm’s fresh goat milk, estate grown olive oil, farm collected honey and other quality ingredients. Pamper yourself! thank you for supporting Redwood Hill Farm! 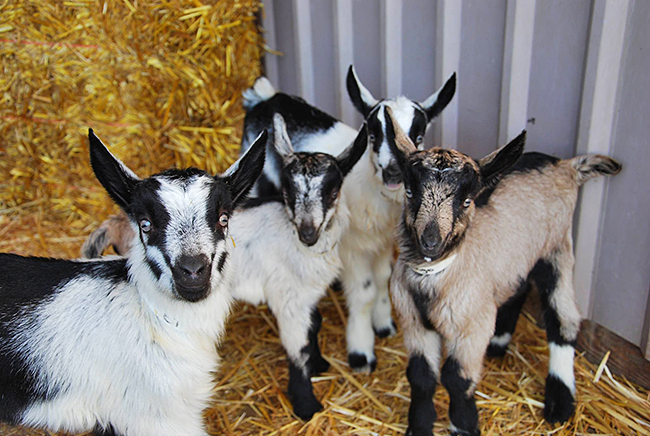 How much do you know about goat kids? 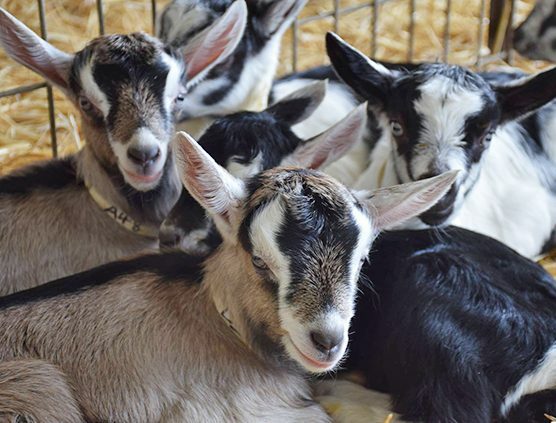 At Redwood Hill Farm we’ve been raising dairy goat kids since the mid 1960’s, and over the years have learned much about these intelligent, cute and cuddly young animals. Here’s our ‘top ten’ of fun facts about goat kids. Humans and goats have enjoyed a close relationship for thousands of years. Nicole Bice, pictured left, and her brother Colton, below, are the next generation of human kids growing up with goat kids on our Certified Humane® farm—kids playing with kids, living and learning together on the farm. 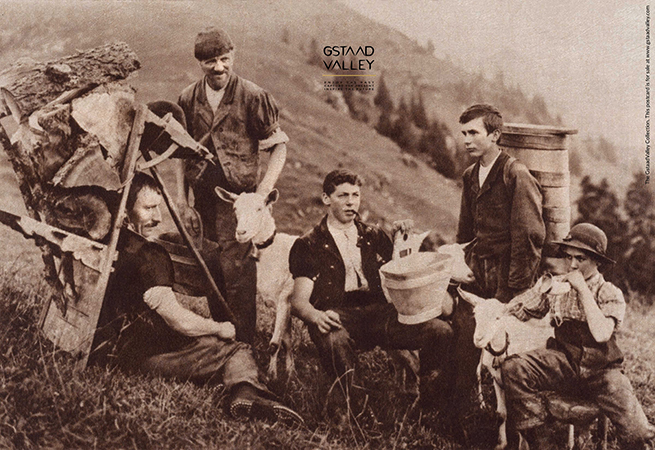 #1 For centuries, the young of a goat have been called kids. It wasn’t until the 1800’s that the word kid was extended to children. #2 Kids most commonly arrive as twins. Sometimes just a single, but often triplets are born. Quadruplets, like the four Alpine cuties above, occur occasionally, and a few times we’ve had quintuplets! #3 Goat kids learn to stand within minutes of being born. #4 Kids begin climbing and jumping off tree stumps and bales of hay when they’re just a week old. At two weeks old, kids are fearlessly agile, running and leaping for fun. 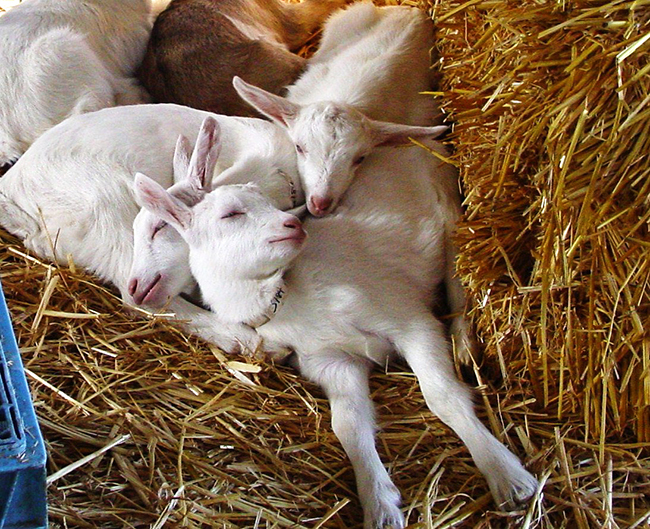 #5 Like human kids, goat kids like to snuggle. The “kid pile” is a common sight in the barn nursery, as they curl up with with each other for companionship and warmth. #6 When bottle-raised, kids will bond with their caregivers. 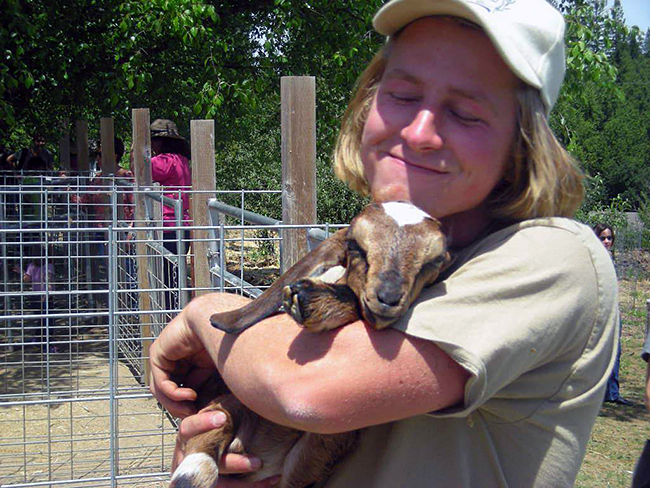 Our employees at Redwood Hill Farm, like Mike above, cherish that bonding time. #7 The vocal sound a goat makes is called a bleat. 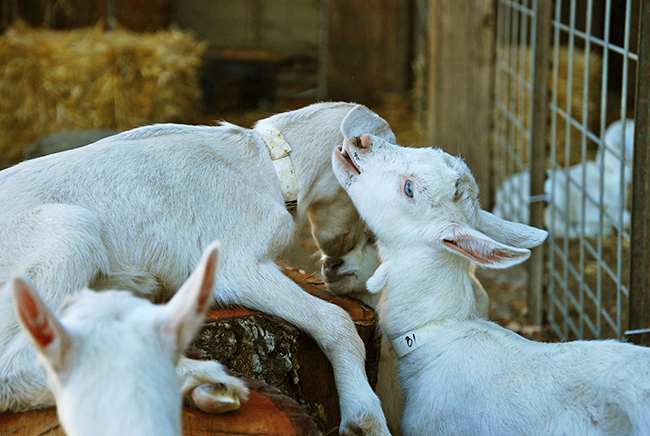 Mother and kid goats recognize each other’s calls soon after the mothers give birth. 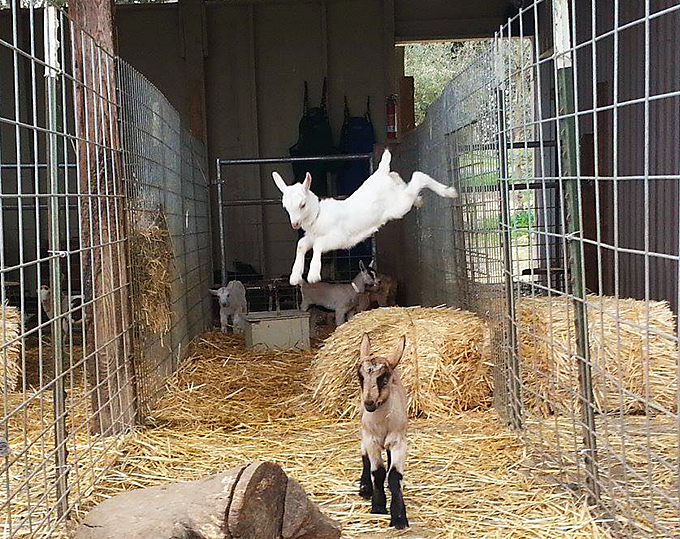 Goat kids also bleat when they’re excited to see their caregivers at feeding time. 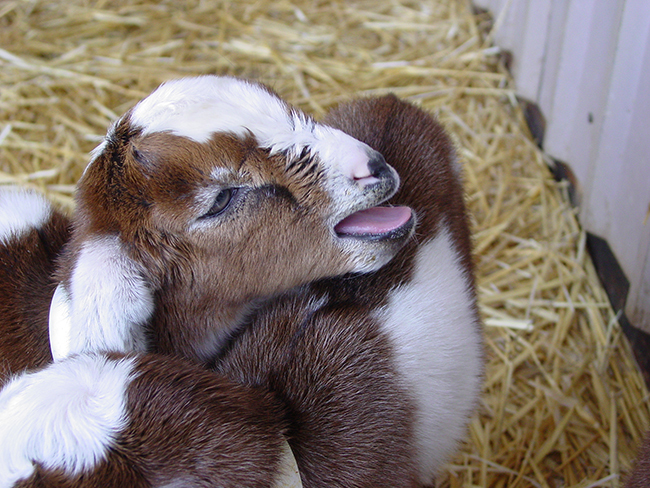 #8 Some goat kids are born with “wattles”, the fleshy, dangly things on their neck. Wattles are sometimes called “bells” or “skin tags”. They serve no purpose and are believed to be a genetic trait left over from evolution. #9 Kids use their lips to learn about the world around them. Intelligent and curious, they love nibbling (not eating!) just about anything around them. #10 Siblings know each other. At Redwood Hill Farm a twin who returned to the farm after being gone for nearly two years, quickly found her twin sister, and the two are best friends in the barn— browsing and resting together every day. 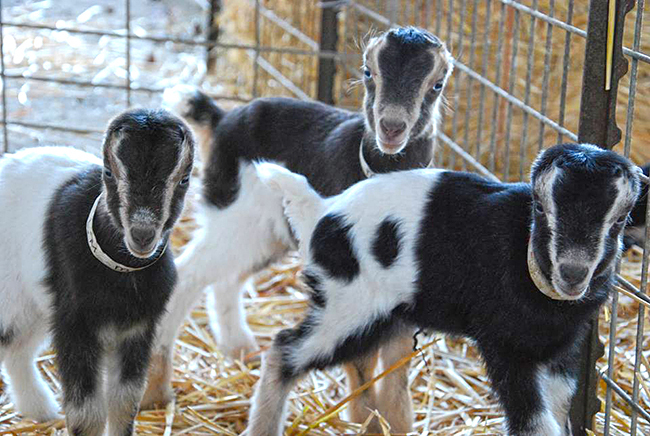 Pictured here are LaMancha triplet kids—who naturally have distinctive and very short ears. 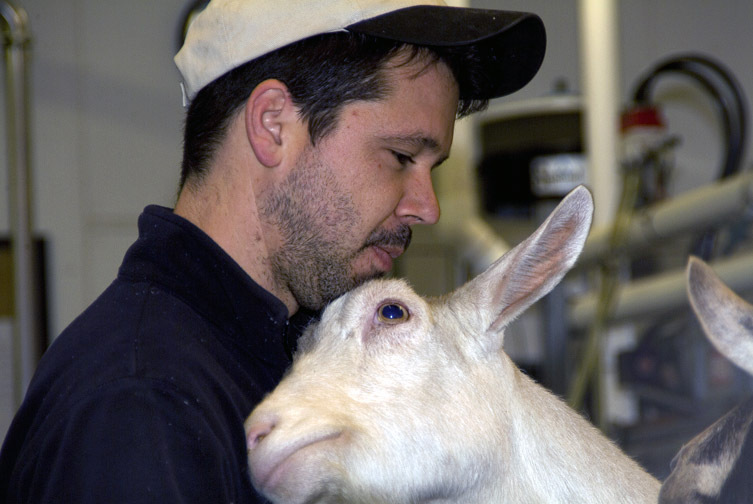 What Makes an Award-Winning Dairy Goat? 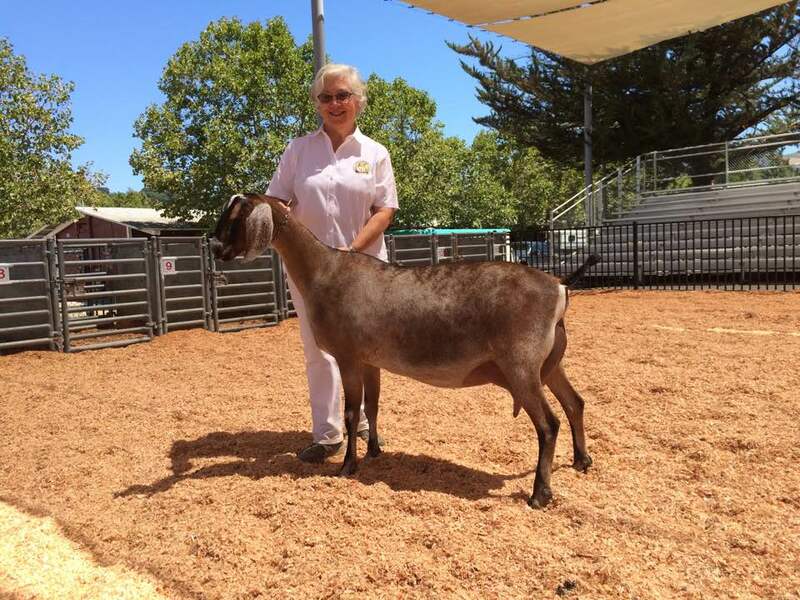 We’ve come to the end of another successful goat show season at Redwood Hill Farm, with championship wins at the California State Fair, the Sonoma County Fair, and others under our belt. 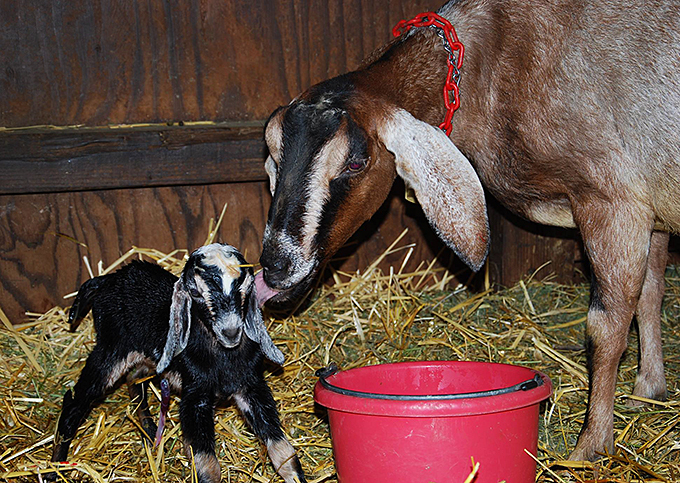 Have you ever wondered what it takes to raise an award-winning dairy goat? 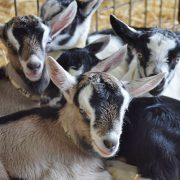 Here, we’ll take you on a visual tour of our herd, and explore some of the qualities that make our goats champions. 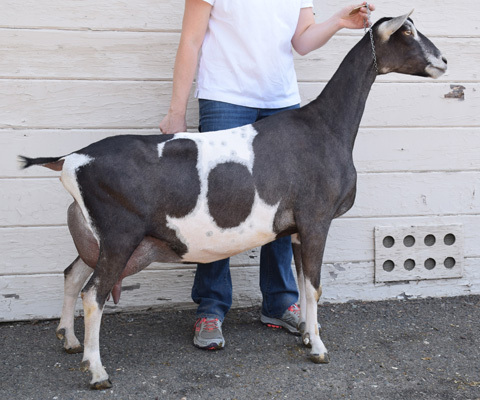 Since the beginning, the goal of Redwood Hill Farm’s dairy goat breeding program has been to achieve “the winning combination of milkability and showability,” a term coined by the late Steven Schack, who started Redwood Hill Farm & Creamery with Jennifer Bice in 1978. 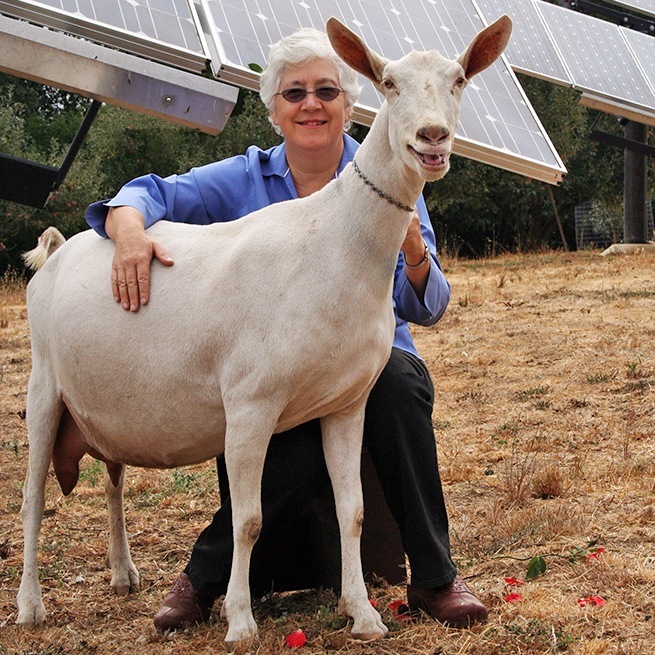 Jennifer’s passion for dairy goats began at a young age, when she and her nine younger siblings raised dairy goats as 4-H projects on their parents’ small farm in Sebastopol, CA. For Jennifer and the other Bice children, attachment to these smart and personable animals came naturally. 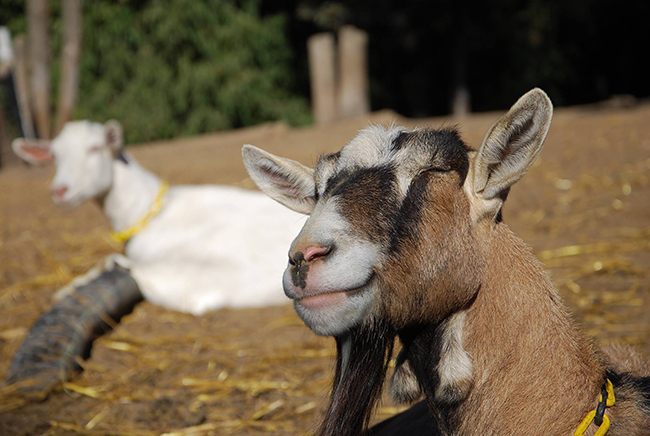 While expanding Redwood Hill Farm’s line of goat milk products and growing their business, Jennifer and Steven’s herd continued to evolve and improve. 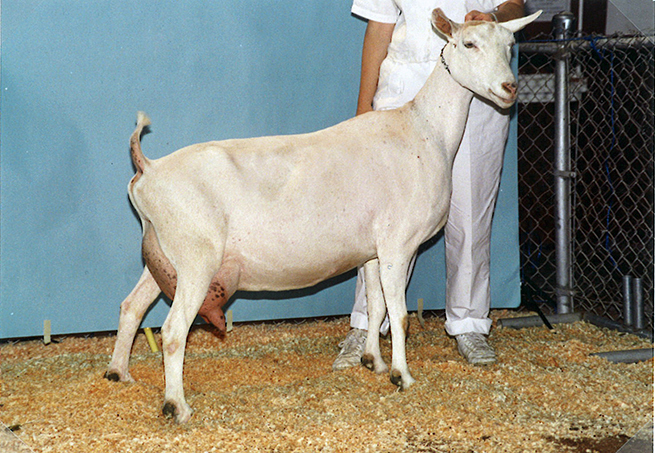 Together, they won their first Premier Breeder of Show award at the ADGA (American Dairy Goat Association) National Show in 1982; then again in 1984 and 1986. Sadly, Steven passed away in 1999. Jennifer kept his herd name—“Compañeros”—to honor his memory and love for the Saanen breed. 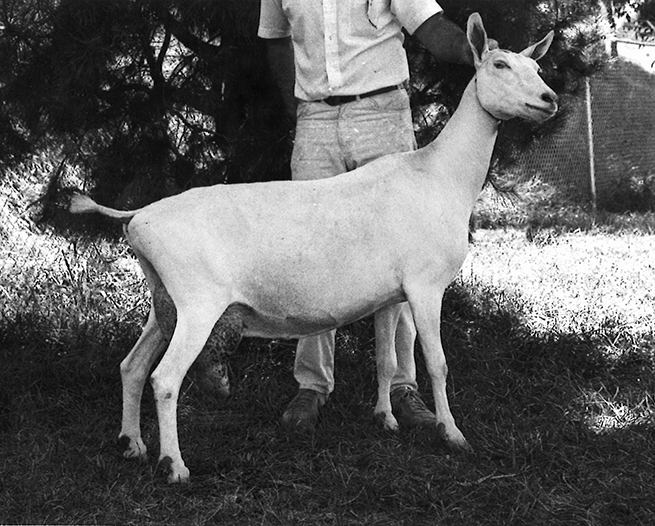 His Compañeros herd of Saanens continues to impact the dairy goat world to this day, and Redwood Hill Farm has been awarded National Champion multiple times in the Saanen, Alpine and Nubian breeds. So, what makes a winning dairy goat? 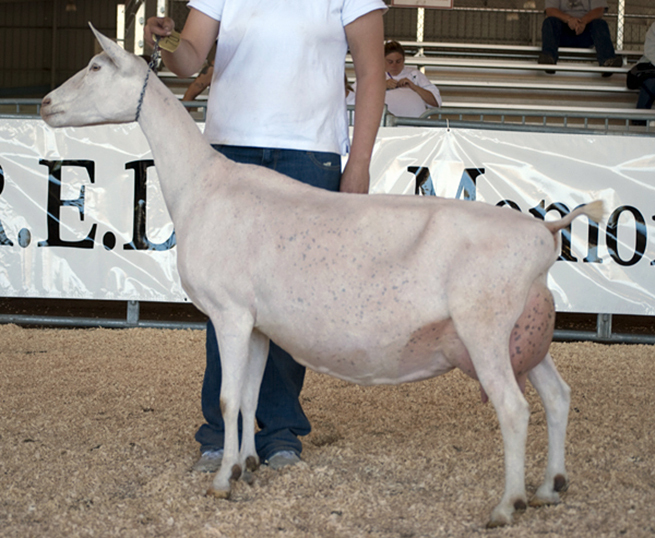 When judging, the ADGA licensed judge is required to evaluate the dairy goat based on four major categories: General Appearance, Dairy Strength, Body Capacity, and Mammary System. This is not a beauty contest; the scorecard, which consists of 100 points total, is based on traits that will ensure a long and productive life. 1. 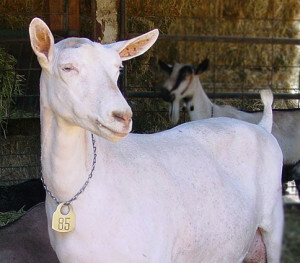 General Appearance is the structure of the dairy goat: including head, back, shoulders, feet and legs. Overall, the judge looks for an attractive framework. 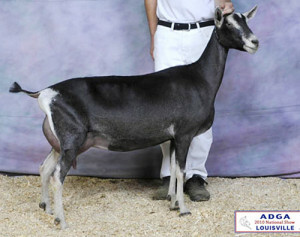 A Lamancha doe,“Kastdemur’s Evian” in the photo below, is a good example of a doe with fine general appearance. 2. Dairy Strength covers attributes that indicate good milk production, such as angularity and openness of the rib and flatness of bone. 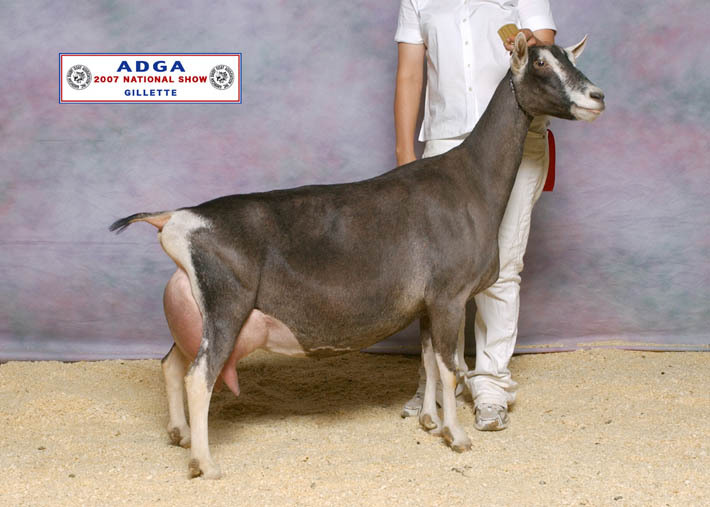 “Amicale” in the photo below excels in dairy strength, and has been awarded National Champion Alpine. 3. Body Capacity correlates the width and depth of the body, ensuring ample capacity, strength and vigor. “Vineyard View Foxy Traveler” below is a Saanen with great body capacity. 4. The Mammary System category evaluates areas of the udder that will be important for a long, productive life. Although capacity in the mammary is significant, teat size, teat placement, udder shape and attachment are also very important. “Redwood Hills Rainbow,” our Alpine shown below, has an excellent overall mammary system. We’re continually improving our herd at Redwood Hill Farm. 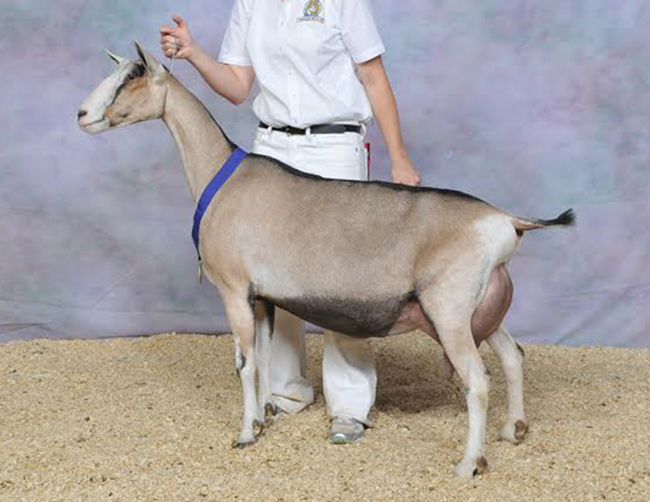 Jennifer is still actively involved in the breeding program and handling goats at shows. Her lifetime with goats began in 4-H, and she’s been a licensed ADGA judge for 42 years. 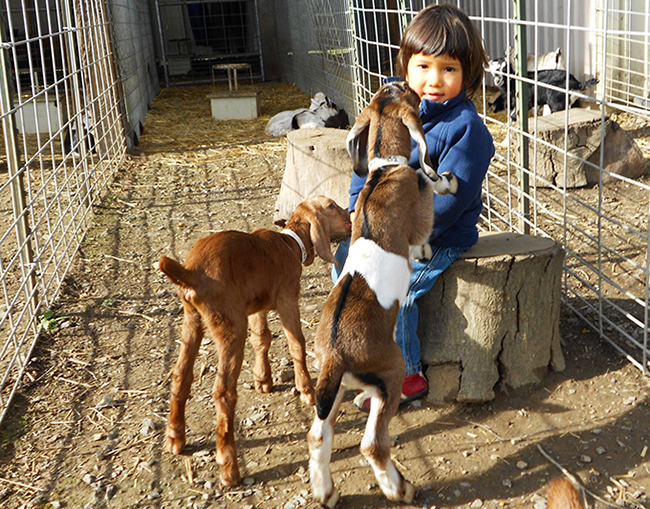 She still likes to call our farm “a 4-H project that went out of control.” Her brother Scott Bice, Farm Manager at Redwood Hill Farm, is also a licensed dairy goat judge and keeps his own herd of “Vineyard View” dairy goats within our herd at Redwood Hill Farm. Scott and the farm crew are busy all year long at our Certified Humane Raised & Handled® farm, keeping the herd healthy and in tip-top shape for goat show season. Of course, good breeding is just the beginning. When goats are happy, healthy and well-bred, you can really taste the difference; the best dairy always comes from the freshest, cleanest milk. 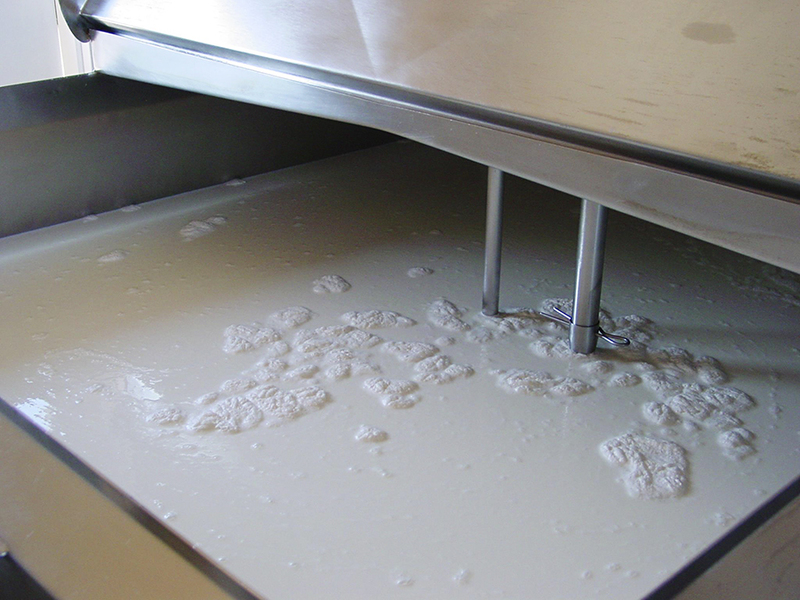 Redwood Hill Farm’s yogurt, kefir and cheese are minimally processed, with a mild and uniquely delicious flavor. Our products have received top prizes from the American Cheese Society, the American Dairy Goat Association, and the California State Fair, to name a few. From award-winning dairy goats come award-winning products. A winning combination. https://redwoodhillfarm.org/wp-content/uploads/2017/03/capracopia-logo-1-sb.png 0 0 David Bice https://redwoodhillfarm.org/wp-content/uploads/2017/03/capracopia-logo-1-sb.png David Bice2017-01-19 23:53:112018-11-30 20:24:35What Makes an Award-Winning Dairy Goat? Our Zimba passed away at the old goat age of 12 years with friends, herdmates, and sister Zoe by her side. One of our very special Alpine does, we are using this blog post for honoring Redwood Hills Zimba. 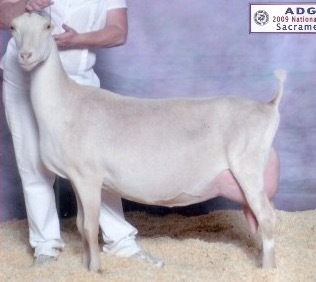 Born in the Spring of 2002 in a kidding that produced twin does, Zimba (SG Redwood Hills Ransom Zimba) is the daughter of the sweet doe Grand Champion Redwood Hills Samurai Zariba and her sire, the wild and reckless buck Willow Run Atlas Ransom. Zimba claimed the loving personality of her mother, and was often found standing at the entrance gate to the barn awaiting workers and visitors alike in hopes for a scratch or pet. One day, Sharon Bice came to the gate where Zimba was waiting, and the now famous photo of our cover girl goat was shot (image above). 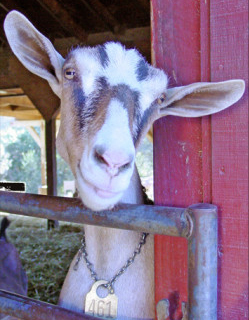 With that photo Zimba quickly became the face of Redwood Hill Farm’s show herd and her portrait graced postcards, magazine pages, and was even painted on a United Natural Foods Inc. semi truck trailer that would deliver the Redwood Hill Farm award-winning dairy goat products to stores. 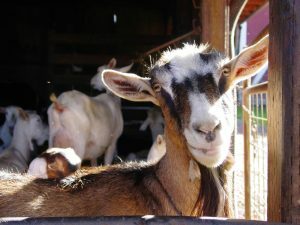 Zimba embraced her fame, and her picture made a cameo appearance along with actress Jennifer Lopez and Alex O’Loughlin in the 2010 film “The Back-up Plan” where Alex portrayed a goat farmer and cheese maker. 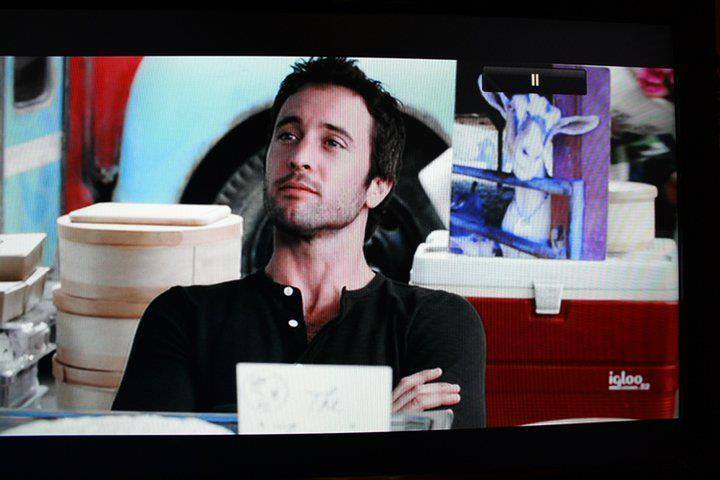 A poster of Zimba appeared in a scene from the shop as well as various Redwood Hill Farm & Creamery goat cheeses (image below). While the film didn’t get great reviews, our herd gives it two hooves up! Zimba was capacious in her mammary system and her talents, writing blog posts for the Bleat Beat Blog on our website. Zimba never let fame effect her work ethic and always performed as one of the best milkers in the dairy. She had two lactations that exceeded over 3,500 lbs in the standard 10-month period in which lactations are measured. 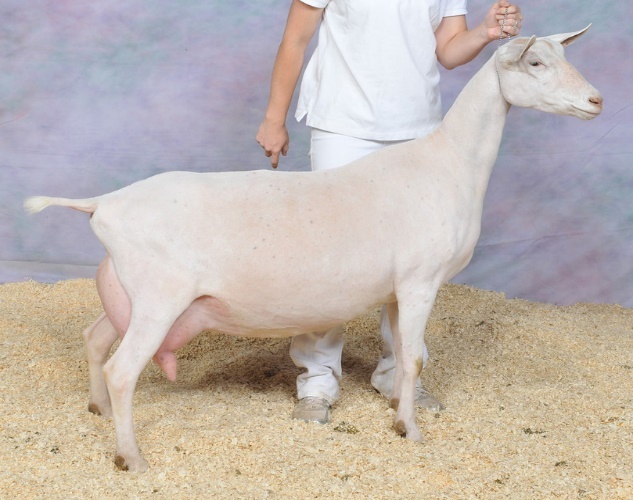 While working hard in the milking parlor, Zimba’s litter mate sister Z0e was hard at work in the show ring, earning her Grand Championship status at a young age. Although they had different claims to fame, these 2 sisters were inseparable on the farm, always entering the milk parlor together and sleeping nuzzled to each other in the barn. Zimba is survived by her sister Z00Loo, as well as kids, grand kids and great grand kids in our herd and herds throughout the nation. 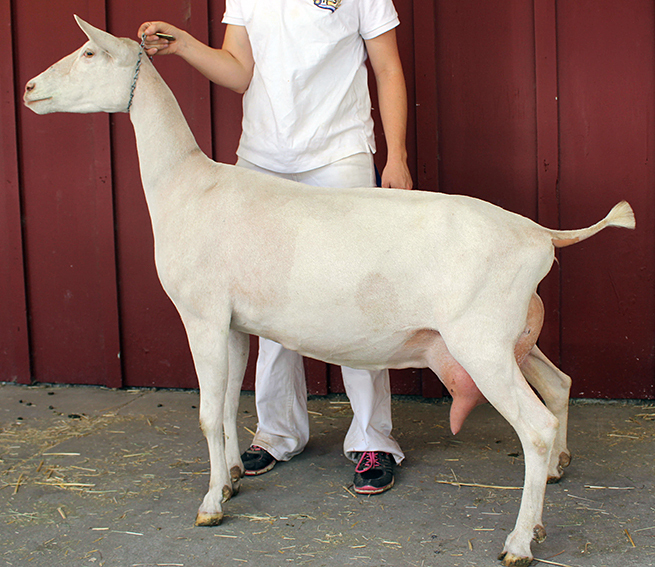 Zimba’s last summer was spent with pride as her daughter Zoo Loo was named the Senior Reserve National Champion at the American Dairy Goat Association’s National Show in Redmond Oregon. 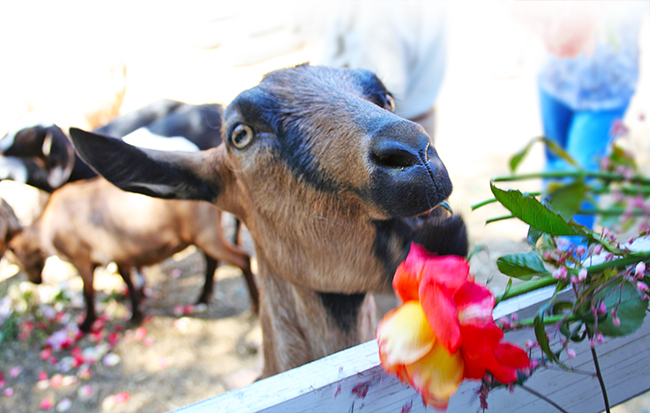 Flowers for the service were happily eaten by Zimba’s herd mates. At Redwood Hill Farm, we’ve been farming gardens and orchards just as long as dairy farming—nearly 50 years. It is typical in Sonoma County to experience an extended dry period, or drought, each summer without rainfall for many months. We are therefore accustomed to using water wisely and have implemented different water conservation systems which include composting, drip irrigation, reclaiming and reusing water, and dry farming. The severe drought conditions of the last four years have challenged us to perfect these techniques as we make the most of the water we have, now more than ever. 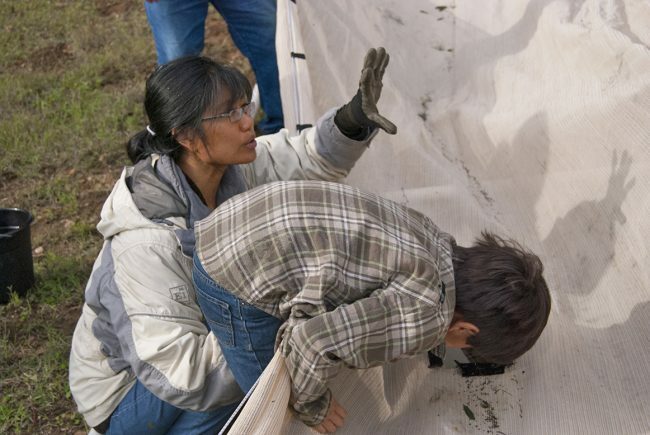 One of the most effective water conservation programs we have in place at our Sonoma County farm near Sebastopol is composting. Composting enables us to use less water while enhancing the cultivation of some of our goat feed, growing our own food, and enriching our farmland overall. Composting is a natural process that turns vegetable matter or manure into a dark rich substance compost or humus. 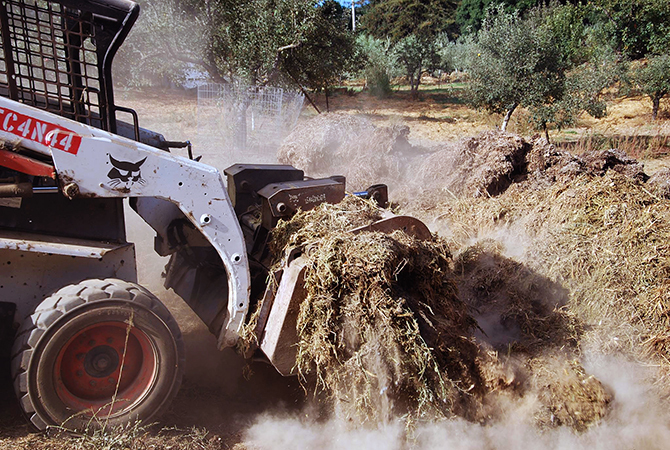 We lovingly call our compost “black gold”: Straw and goat manure are gleaned from our loafing barns and are composted over time in large piles and then spread throughout our gardens, apple and olive orchards. Composting conserves water as it decreases evaporation of moisture from the soil and enables the soil to hold more water in. In addition, it reduces water runoff and topsoil erosion during the rainy season. 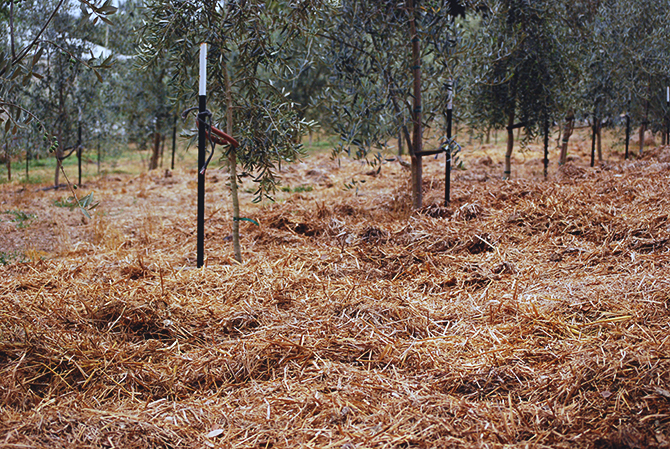 As rainwater is caught and filtered through the straw down into the soil, orchards and gardens are fed with the nutrients from the rotting compost. 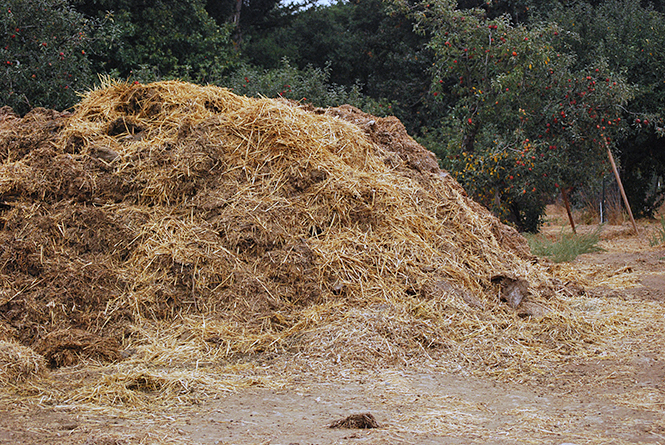 Over the winter and into the next spring, the straw and manure compost continues to break down. The bottom layers, with the help of worms and other composting insects, turn the compost slowly into rich, loamy topsoil. 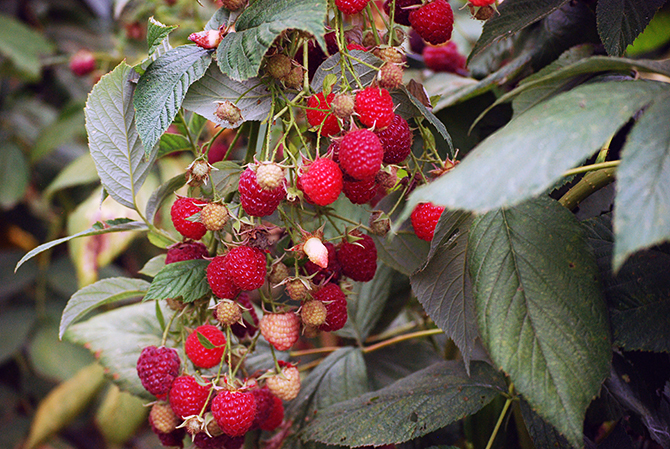 Our Olalee blackberries, raspberries and blueberry shrubs, all benefit from a deep bed of compost. 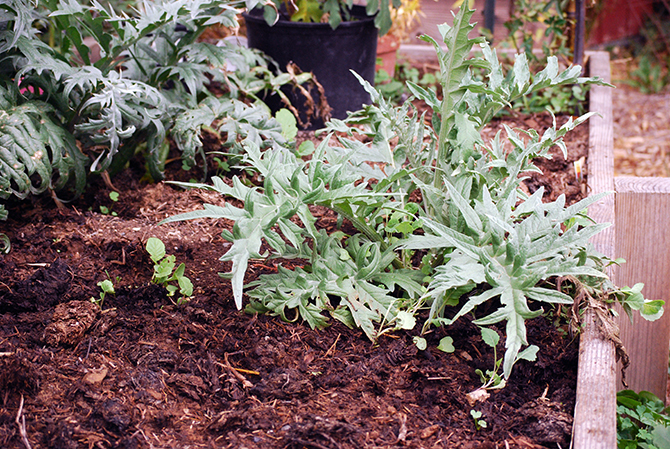 Up to 70% of water can evaporate from the soil on a hot day if there is no mulch as a protective layer on top. In addition to mulching our food and flower garden boxes at the farm, we use drip irrigation systems throughout the farm for our young, olive orchard as well as for the raised garden beds, blueberry shrubs and other berries that we grow for food each year. Drip irrigation, also known as “trickle irrigation” is a simple, but very effective system that consists of a network of tubes and emitters to focus the water close to the plants and young trees. This allows the water to drip slowly in those areas. Compared to traditional, overhead watering this method is very efficient in reducing evaporation and delivering only the necessary amount of water directly to the base of the plant, just where it is needed. 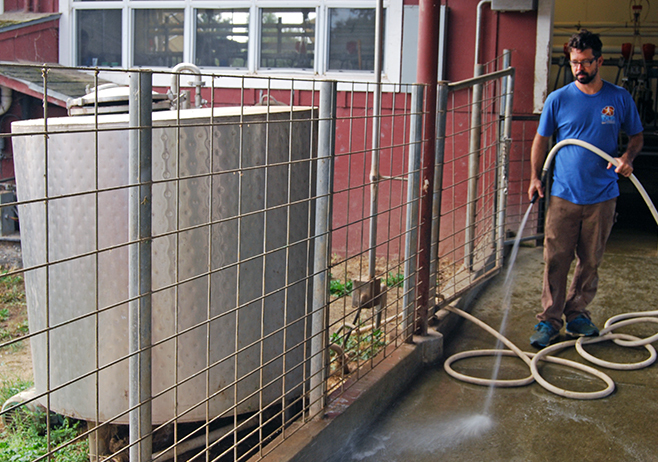 Farm Manager Scott Bice washing-up dairy walkways by reusing water from the reclaim storage tank. In the dairy milking parlor we continue our water conservation efforts by reclaiming and reusing water from our equipment’s automatic wash cycle. After the wash cycle, the water is directed to a holding tank where any sediment settles. The grey water from that tank is siphoned, pumped and then used to wash the floors of the dairy barn each day. Sonoma County has long been known for the delicious Gravenstein apple’s commercial production and growing apples has been a tradition from Redwood Hill Farm’s very beginning, almost five decades ago. 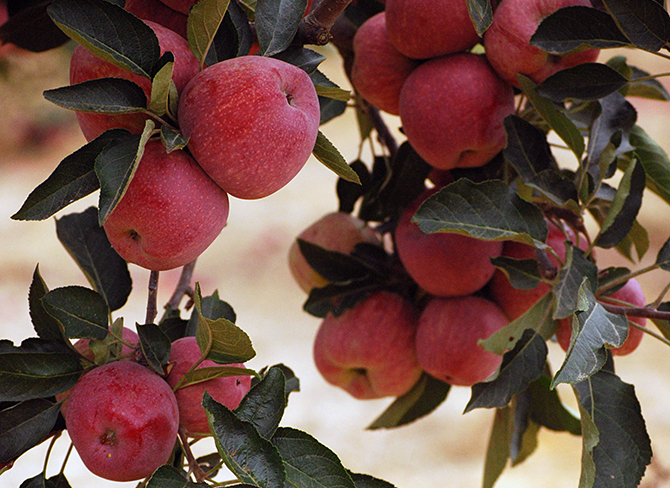 We have over 15 different apple varieties in our abundant orchard, which is entirely dry farmed. Dry farming is a system of growing crops in low water or arid regions and means that no water or artificial irrigation are used on the trees except for the water they receive with the winter and spring rains. 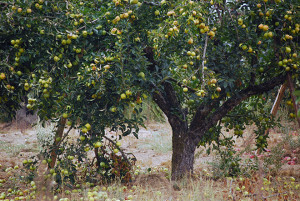 While the fruit size is typically smaller than an irrigated orchard, the yields are very good. Healthy topsoil is critical to sustainable dry farming, and preserving the soil is considered an important long-term goal of our orchard’s dry farmed operation. We use no- or reduced tilling, and straw compost spreading throughout to protect and replenish the orchard’s valuable topsoil. 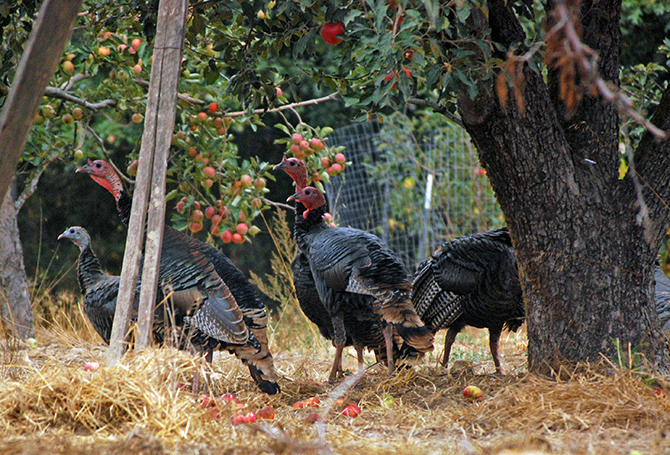 Our free-range chickens as well as the rabbits, deer, turkeys and other wildlife that live in and around the farm appreciate our efforts as they enjoy the abundance of the land. As we continue to harvest our apples and notice the leaves that begin to turn to their bright fall colors, we’re hopefully optimistic for more rainfall this winter. Meteorologists are predicting with a high certainty that an “El Niño” weather pattern is developing. This means winter and spring rainfall for the West Coast – and hopefully lots of it to soak the fields and gardens on our farm once again. Conserving precious water is on our minds as we are facing another year of severe drought in California. We’re resilient folks, and are constantly looking at ways in which we can do our part at the Farm as well as at the creamery. 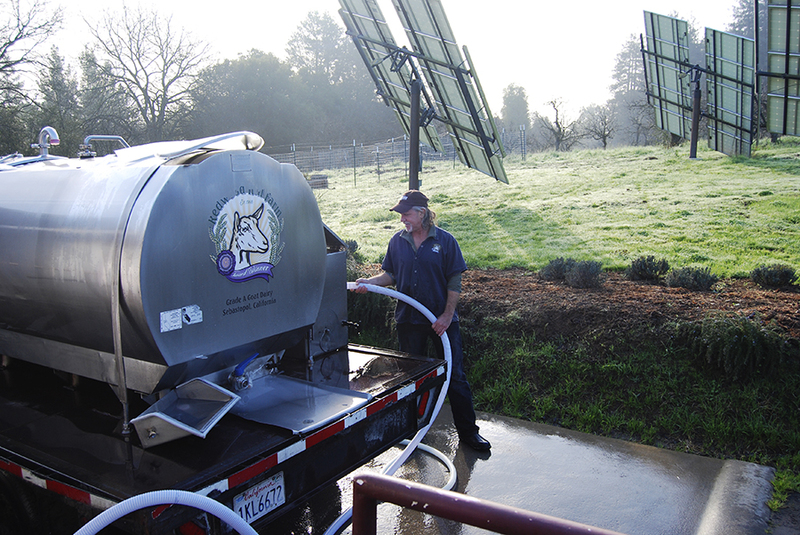 Redwood Hill Farm Manager Scott Bice’s most recent water-saving project on the farm is one we’re very excited about. 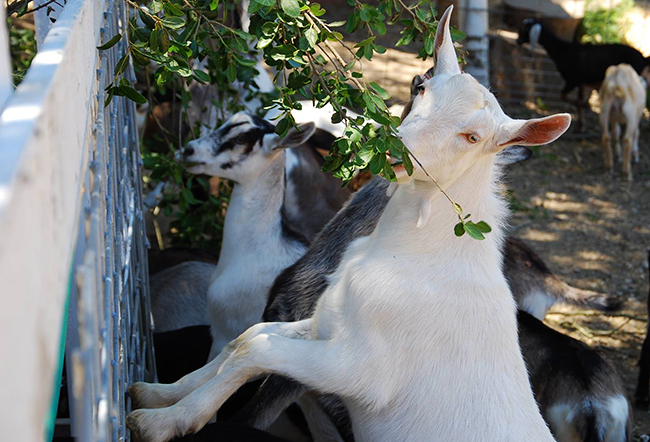 We are now growing some of our goat’s feed, a drought-tolerant, leafy shrub called Tagasaste, right on the farm – and the goats love to eat it. Farm Manager Scott Bice recording plant growth before cutting. 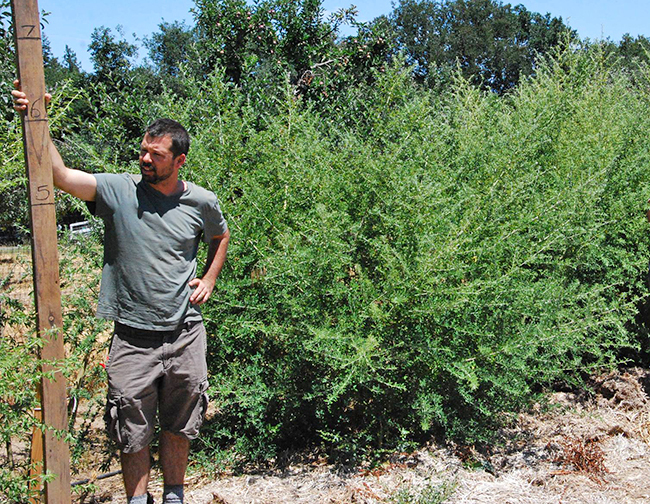 To harvest, we cut the shrubby trees to about 4 ft. and allow to re-grow. At Redwood Hill Farm, we’ve started with half an acre trial in an open area of our apple orchard. The trees love the loamy soil, have proved to use little water once established, and are adapting well. Our Kawasaki Mule loaded with Tagasaste. Next stop: the goats! Besides a green feed crop for animals, Tagasaste provides shade and shelter, controls erosion, and serves as habitat for birds, some of which eat and control pests. 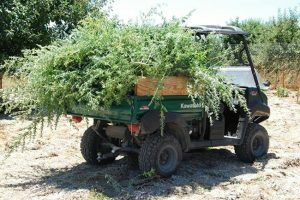 They are perennial shrubs that need very little water and that, once sheared, re-grow and produce more forage on less acreage than traditional goat feed like alfalfa and grass hay. In our northern California climate, growth slows during the shorter and colder days. It is evergreen, but we harvest just 7-8 months of the year. 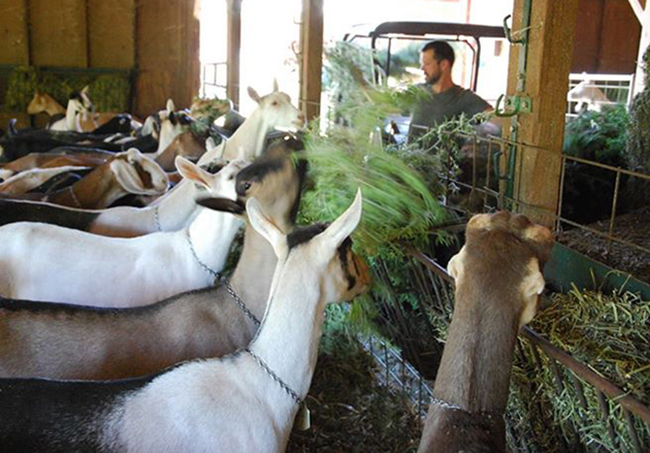 High in protein, Tagasaste is nutrient-dense—an important factor for our goat’s diet. 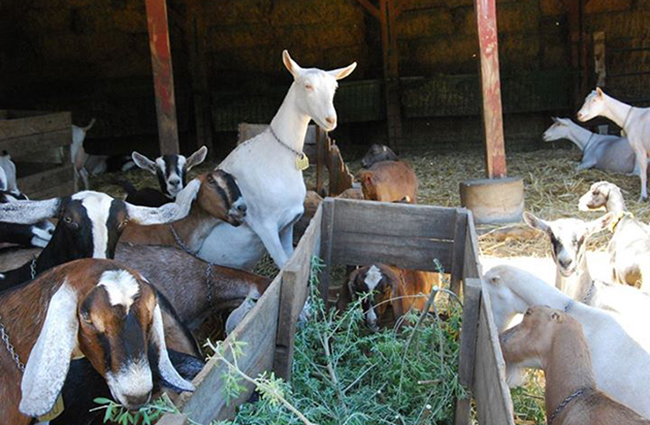 With Tagasaste we can eliminate a portion of the alfalfa and other hays that are otherwise trucked in for the goats. Because of the drought, feed prices are ever rising – this doesn’t only reduce our carbon footprint, but is a good business decision as well. Tagasaste blooms are high in pollen and nectar for our bees at a time when other sources are scarce; flowering occurs from Winter to very early Spring. And the final reason we’re excited about Tagasaste? Our goats love it! “Goat people” love to collect all kinds of goaty items. Enjoy this collection of some of Jennifer’s favorite art pieces collected over her 45+ years of owning and loving dairy goats. Hover over any image to read details and history or click on images to view in a larger format. 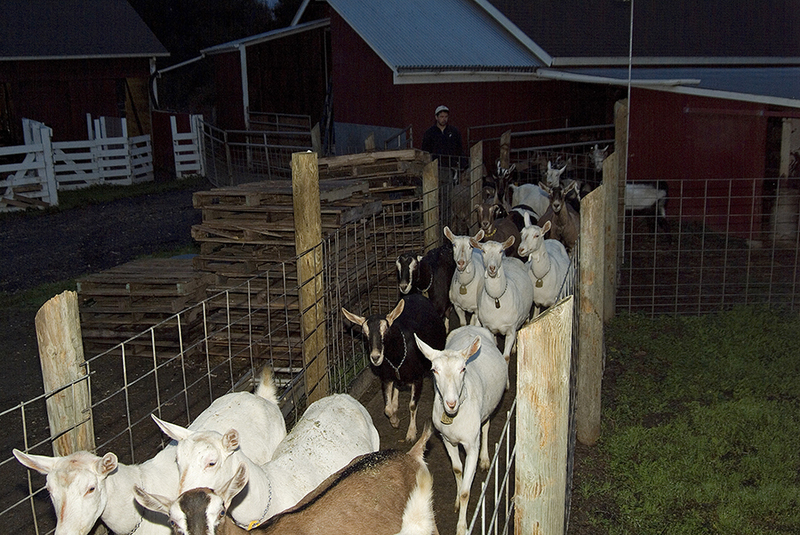 Our Goat Milk’s Journey, from the farm to you. 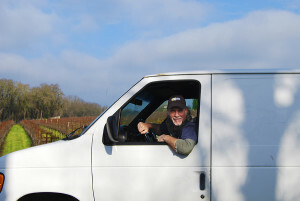 Redwood Hill Farm has been a family farm in west Sonoma County for nearly 50 years. 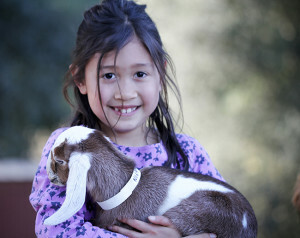 It began in 1968 when our parents, Cynthia and Kenneth Bice (with then seven kids), moved from Los Angeles to the rural hills of Sebastopol and bought their very first goat named “Flopsy”. As a family and later under the leadership of oldest sister, Jennifer Bice, we have been making our cultured yogurt, kefir and artisan cheese for our goat milk loving customers since the early 1970’s. We invite you on a journey to follow our fresh goat milk as it travels from our Certified Humane® goat farm in Sebastopol, CA, to your neighborhood store. Scott Bice guides the Redwood Hill Farm herd head into the milking parlor where it all begins. 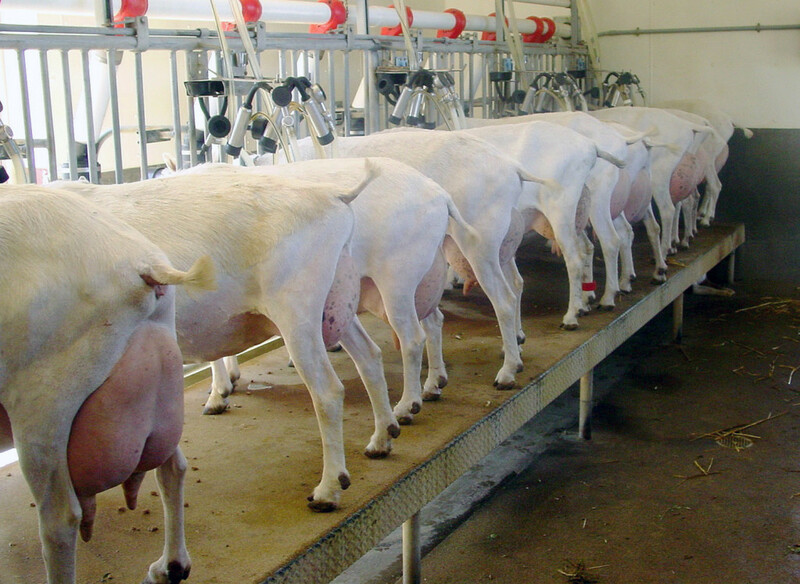 Dairy goats are milked twice a day, at 6 a.m. and 5:30 p.m. An average milking goat will give 2,000 lbs. of milk in a year. Our top performing dairy goats, which are nationwide leaders in milk production, may give up to two tons of milk annually! Our dairy does look forward to milking time. They are very social animals, and Farm Manager Scott Bice not only knows them by name but also is also quite aware of their different personalities. Aside from getting a pat from the herdsman, milking time is when the does enjoy their custom milled, protein-rich grain mix, which makes up about 25% of their diet; the remaining 75% consists of fresh forages, brush and hay. We raise four different breeds of dairy goats on our farm, who in turn give us the best-tasting milk for our probiotic yogurt, kefir and artisan cheeses. 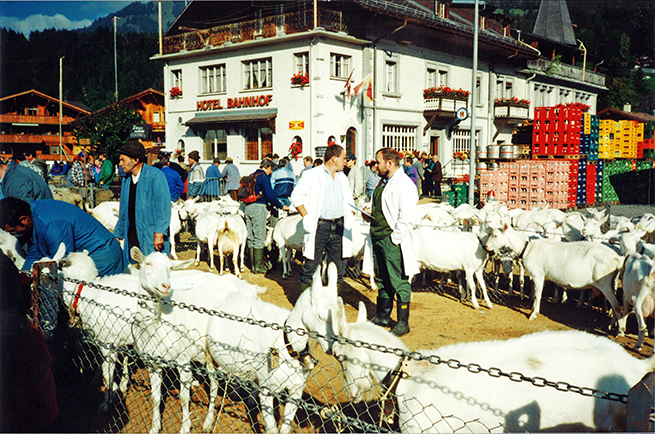 Pictured here are Saanen dairy goats, a breed that originated in Switzerland. Compared to cow milk, goat milk contains higher levels of calcium, vitamin A, potassium and niacin. Milking machines transport the fresh, raw goat milk through filters into our milk parlor’s holding tank, where it is immediately chilled and held at 38 to 40 degrees. Notice the “cream clouds” at the top. Goat milk, unlike cow milk, is “naturally homogenized,” which means that most of the fat globules are evenly dispersed throughout the milk. 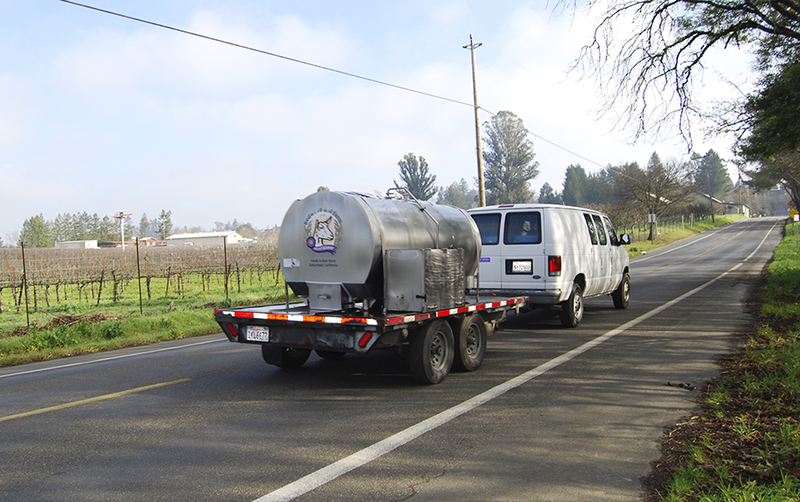 Throughout the week, our fresh milk is transported to Redwood Hill Farm Creamery, located only four miles from the farm. Pictured here, David Bice fills milk into the tanker for another load. 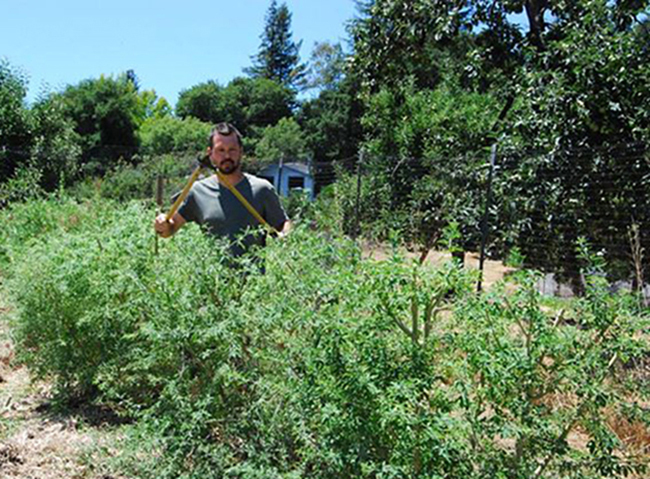 Enjoying the rural countryside of beautiful West Sonoma County is a perk for employees doing this farm chore. https://redwoodhillfarm.org/wp-content/uploads/2017/03/capracopia-logo-1-sb.png 0 0 David Bice https://redwoodhillfarm.org/wp-content/uploads/2017/03/capracopia-logo-1-sb.png David Bice2015-02-17 05:41:592018-11-30 20:25:46Our Goat Milk's Journey, from the farm to you.